It’s official: Pluto’s “heart” now bears the name of pioneering American astronomer Clyde Tombaugh, who discovered Pluto in 1930. And a crater on Pluto is now officially named after Venetia Burney, the British schoolgirl who in 1930 suggested the name “Pluto,” Roman god of the underworld, for Tombaugh’s newly-discovered planet. Tombaugh Regio and Burney crater are among the first set of official Pluto feature names approved by the International Astronomical Union (IAU), the internationally recognized authority for naming celestial bodies and their surface features. These and other names were proposed by NASA’s New Horizons team following the first reconnaissance of Pluto and its moons by the New Horizons spacecraft in 2015. The New Horizons science team had been using these and other place names informally to describe the many regions, mountain ranges, plains, valleys and craters discovered during the first close-up look at the surfaces of Pluto and its largest moon, Charon. A total of 14 Pluto place names have now been made official by the IAU; many more will soon be proposed to the IAU, both on Pluto and on its moons. “The approved designations honor many people and space missions who paved the way for the historic exploration of Pluto and the Kuiper Belt, the farthest worlds ever explored,” said Alan Stern, New Horizons principal investigator from Southwest Research Institute, Boulder, Colorado. Stern applauded the work of the New Horizons Nomenclature Working Group, which along with Stern included science team members Mark Showalter — the group’s chairman and liaison to the IAU — Ross Beyer, Will Grundy, William McKinnon, Jeff Moore, Cathy Olkin, Paul Schenk and Amanda Zangari. The team gathered many ideas during the “Our Pluto” online naming campaign in 2015. 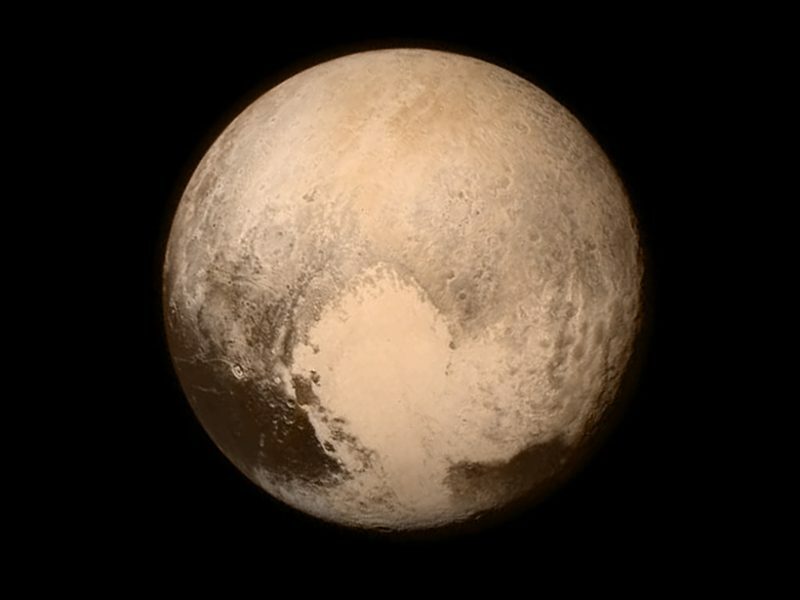 Following on Venetia Burney’s original suggestion, several place names on Pluto come from underworld mythology. “I’m delighted that most of the approved names were originally recommended by members of the public,” said Showalter, of the SETI Institute, Mountain View, California. The approved Pluto surface feature names are listed below. The names pay homage to the underworld mythology, pioneering space missions, historic pioneers who crossed new horizons in exploration, and scientists and engineers associated with Pluto and the Kuiper Belt. Burney crater honors Venetia Burney (1918-2009), who as an 11-year-old schoolgirl suggested the name “Pluto” for Clyde Tombaugh’s newly discovered planet. Later in life she taught mathematics and economics. Elliot crater recognizes James Elliot (1943-2011), an MIT researcher who pioneered the use of stellar occultations to study the solar system – leading to discoveries such as the rings of Uranus and the first detection of Pluto’s thin atmosphere. The discovery of the slightly more massive object Eris inspired the International Astronomical Union’s (IAU) decision. Proponents of the change insisted that if Pluto got to keep the label “planet,” so too should similarly sized objects—like Ceres, for instance, which was then considered a large asteroid. 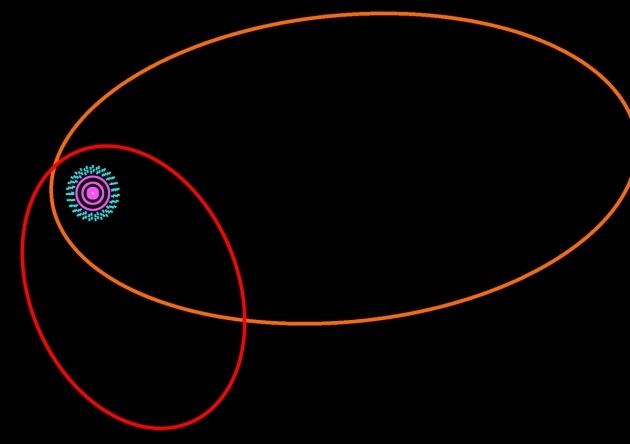 A dwarf planet, by IAU’s new definition, must directly orbit the Sun. It must be massive enough for gravity to pull it into a roughly spherical shape. But unlike regular planets, dwarf planets haven’t cleared other smaller celestial debris out of its orbital path. 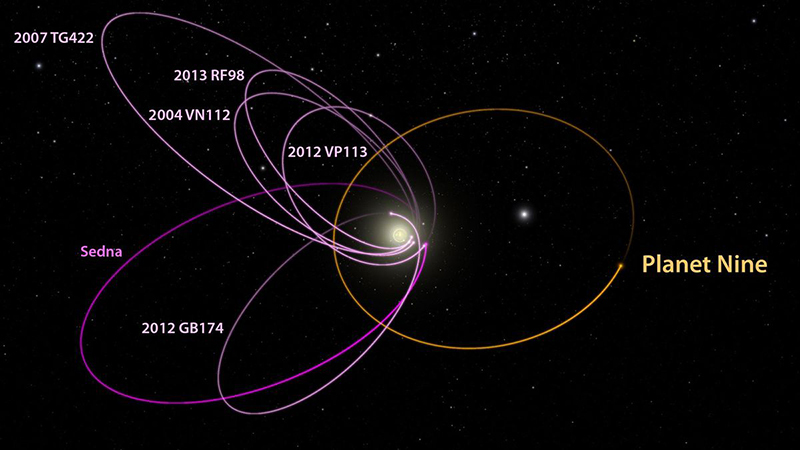 As more objects got discovered, Pluto’s new label “dwarf planet” stuck. Then the jokes began. Facebook group pages popped up, with snarky titles of “When I was your age, Pluto was a planet!” Angry Pluto enthusiasts wrote hate mail to astronomer Mike “Pluto Killer” Brown, one of the scientists who found Eris. Astrophysicist Neil deGrasse Tyson, a strong proponent of the dwarf planet label, received his own stream of hate mail from crushed 6-year-olds; Twitter users still hurl insults at him occasionally. 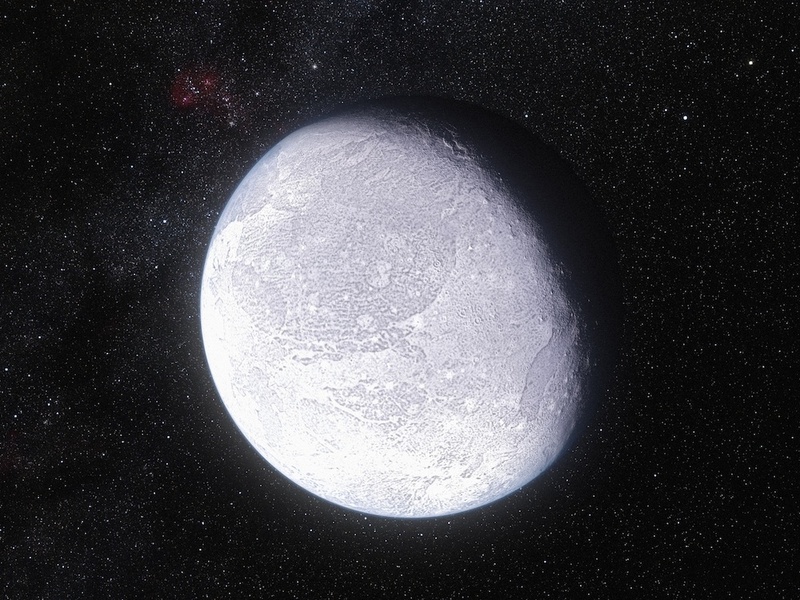 Although some consider the reclassification a “demotion,” Pluto and its cousins Ceres, Makemake, Eris, Haumea, and others continue to dazzle scientists with their strange features and surprising geology. But perhaps more critically, these dwarf planets also trace a trail of scientific breadcrumbs that scientists can follow back in time to understand the origins of the solar system. “I like to think of Pluto being the dwarf planet that showed us how the solar system’s architecture came to be,” said Renu Malhotra, a planetary scientist at University of Arizona’s Lunar and Planetary Laboratory. Here are six such revelations about the solar system that we gained from studying dwarf planets. When the New Horizons probe passed by Pluto more than a year ago, scientists found a complex system with areas of geologically young surface and evidence of active geology. Pluto, the images revealed, wasn’t just a chunk of rock orbiting in space. “Even I underestimated what we would find,” said Alan Stern, principal investigator of the New Horizons mission. Pluto continues to stun scientists with its unexpected surface features, but its newly revealed complexity is just the beginning. Makemake has no atmosphere. Haumea spins faster than any other known large object in the solar system. Eris might have a thin, icy surface. Ceres hosts mysterious bright spots. By studying the particular orbital relationship between Pluto and Neptune, scientists figured out how Neptune got to its current position in the solar system. 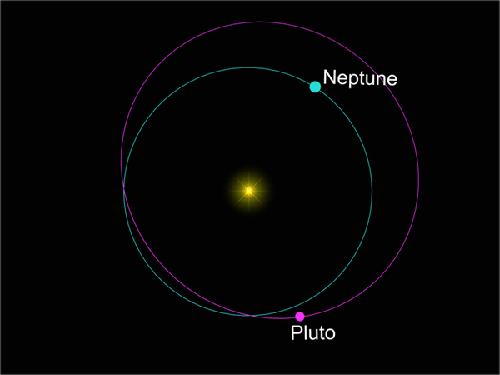 The two bodies are inextricably locked in an orbital resonance: Every time Neptune orbits the Sun three times, Pluto orbits twice, which means that even though Pluto may occasionally cross Neptune’s orbital path, they will never meet. Scientists have always known about this resonance, but it was Malhotra who realized its significance. In a 1995 paper, Malhotra calculated that the only way Neptune and Pluto could have ended up in this resonance was if they both had formed closer to the Sun, then migrated out. Scientists theorize that in the early days of the solar system, the gas giants, Jupiter, Saturn, Neptune, and Uranus, migrated inward toward the Sun and knocked out leftover debris. This gravitational push on planetary debris ended up changing the planets’ orbits as well, sending Neptune farther out. Neptune’s gravitational force encountered Pluto’s, and the two bodies pushed and pulled at each other until they fell into a resonance orbit. Astronomers detected the same effect in other bodies, including a new dwarf planet announced to the world this year. Dwarf planets are handy guides to the ancient solar system. For instance, all the Kuiper belt dwarf planets—Pluto, Haumea, Makemake, and Eris—have moons that scientists suspect formed from high-impact collisions, said Scott Sheppard, an astronomer at the Carnegie Institution for Science in Washington, D. C. Haumea in particular is the only known Kuiper belt object to have a “family” that orbits along with Haumea and its moons, meaning that the debris kicked off by an impact long ago didn’t have enough energy to escape Haumea’s gravitational pull. 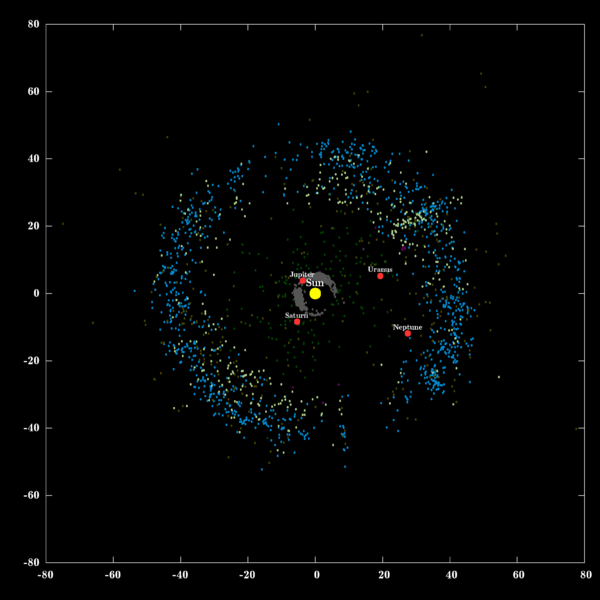 The presence of such moons is further evidence of an early period of “late heavy bombardment” of objects in the solar system. Scientists think that during this time, about 3.8–4 billion years ago, gravitational interactions between Jupiter, Saturn, and Neptune sent comets and asteroids sprawling across the solar system to collide with planets. In the last 2 years, Ceres has also provided various windows into the past. In 2015, NASA’s Dawn probe headed to the dwarf planet after visiting the asteroid Vesta. There, scientists detected ammonia-rich clays in Ceres’s surface. Ammonia itself isn’t stable at the temperatures found on Ceres (130–200 kelvins), but it is plentiful in the outer solar system. So how did the molecule get there? Scientists have formulated different hypotheses, said Carol Raymond, deputy principal investigator for Dawn. Either Ceres formed in the outer solar system, during its early days, and got kicked inward by a chaotic migration of the gas giants, or Ceres formed in the asteroid belt, and somehow ammonia-rich material from the outer solar system made its way inward. Further study of Ceres will help clarify details of solar system formation, Raymond said. Thanks to a handful of debris orbiting farther away than Pluto, scientists this year found evidence that a rocky, Neptune-sized planet may lurk beyond the gaze of even our most powerful telescopes. The story began in 2003, when Brown and his team at the California Institute of Technology (Caltech) discovered Sedna, a dwarf planet candidate that orbits far beyond the Kuiper belt, Pluto’s neighborhood of large, icy bodies 30 astronomical units (AU) away. Sedna maintains a steady orbit and comes within only 76 AU of the Sun at its closest approach. Since then, scientists have spotted several more objects near Sedna, including 2012 VP113, found by Sheppard and colleague Chad Trujillo of Hawaii’s Gemini Observatory. The pair noticed that their new object and the rest of these far-away objects had similar, steady orbits. Back at Caltech, after reading Sheppard’s and Trujillo’s work, Brown and his colleagues set out to find the cause of such clustering, and after many hours of poring over models and simulations, they officially proposed that only a planet-sized body could exert enough gravitational pull to keep the far-away cluster of dwarf-planet-sized objects in steady orbits. This hypothesized planet was deemed Planet 9 (sometimes called Planet X). Kuiper belt dwarf planets aren’t the only thing keeping scientists busy. Dawn mission scientists recently discovered that regions of Ceres contain higher concentrations of carbonate minerals than anywhere outside of the Earth’s ocean floor. These minerals reveal that Ceres is like a “fossilized” ocean world, Raymond explained. They could be the remnants of a vast ocean that once existed on the dwarf planet. 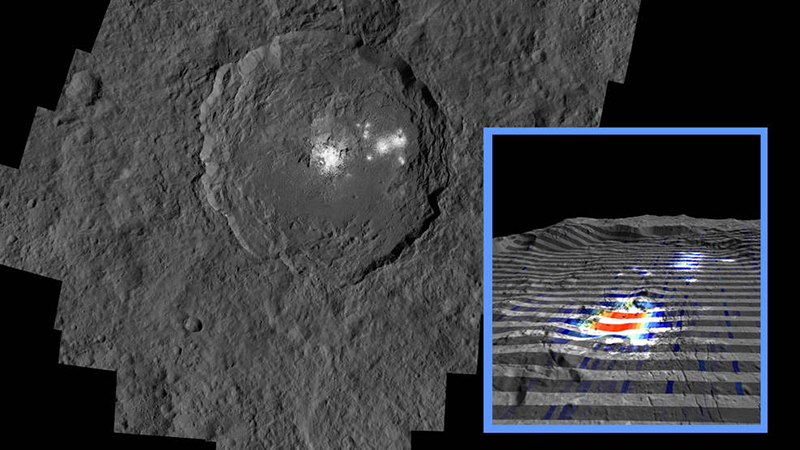 In Ceres’s geologically young Occator crater, scientists figured out that mysterious bright patches come from sodium carbonate, a highly reflective mineral found in hydrothermal environments under Earth’s oceans. This means that at some point in Ceres’s history, hydrothermal processes must have pushed this material to the surface, Raymond said. If hydrothermal processes are confirmed, Ceres’s surface may be analogous to the current seafloors underneath the solar system’s ice-covered moons. Astrobiologists yearn to peek below the icy shells of Jupiter’s and Saturn’s moons Europa and Enceladus because there are vast oceans underneath, and life needs water to proliferate. 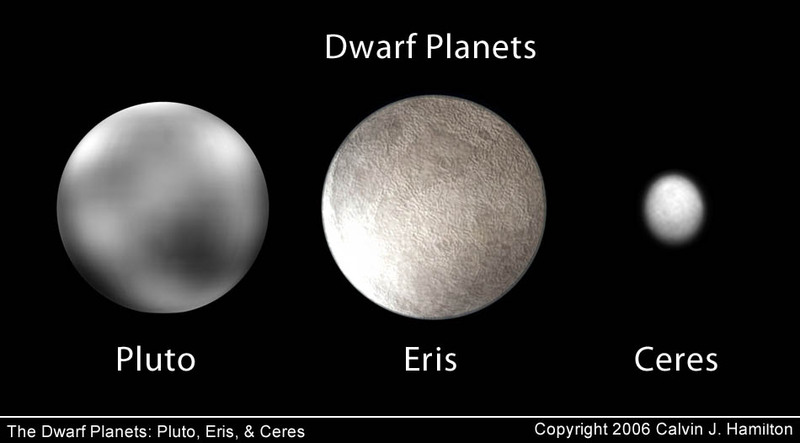 Ceres is similar to these moons because 25% of the dwarf planet is water ice. Plus, its seafloor-type conditions are “where all of the elements necessary for habitability occur together,” Raymond said. Pluto holds a special place in the Internet’s collective heart but may not be so special in the solar system. Currently, there are six dwarf planets officially designated by the IAU: Pluto, Ceres, Eris, Makemake, Haumea, and 2015 RR245, discovered in July. Since scientists started looking deeper into the Kuiper belt, they have found at least 20 more similarly sized objects, Sheppard said. And there may be dozens more out there. “We discovered that dwarf planets are the most populous class in the solar system,” Stern said. Other galaxies may be like ours, too, he added. This population revelation, along with the surprising geological and atmospheric complexity found on dwarf planets, means that the field could be “at the very beginning of a paradigm shift and a revolution,” Stern said. Perhaps, he continued, it’s the classic large planets that are the “oddballs” of planetary formation. 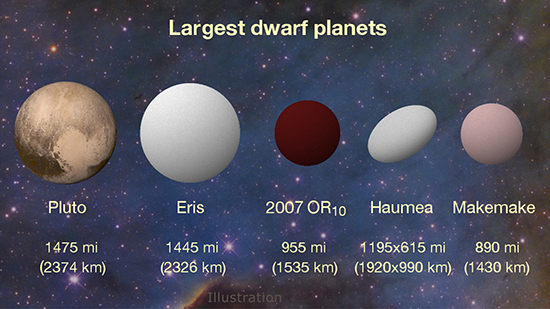 In addition to eight full-size planets, the solar system is home to a number of smaller “dwarf planets.” One of these, Eris, is almost the exact same size as the most well-known member of the collection, Pluto. The researchers concluded that Eris is a spherical body. 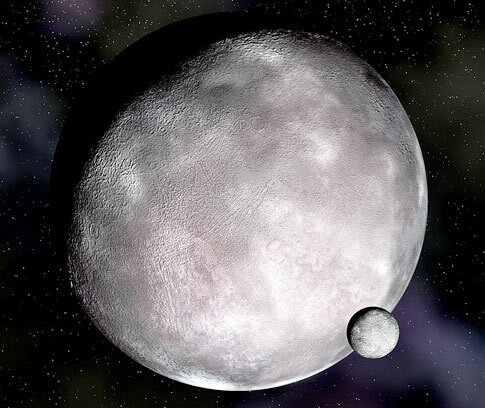 And, by studying the motion of Eris’ moon Dysnomia, they peg the dwarf planet to be about 27 percent heavier than Pluto, which means it’s considerably denser than Pluto as well. “This density means that Eris is probably a large rocky body covered in a relatively thin mantle of ice,” said co-author Emmanuel Jehin, of the Institut d’Astrophysique de I’Université de Liège in Belgium. Eris’ surface was also found to be extremely reflective, bouncing back 96 percent of the light that strikes it. That makes Eris one of the most reflective bodies in the solar system, roughly on par with Saturn’s icy moon Enceladus. Researchers believe Eris’ surface is probably composed of a nitrogen-rich ice mixed with frozen methane in a layer less than 1 millimeter thick. This ice layer could result from the dwarf planet’s atmosphere condensing as frost onto its surface periodically as it moves away from the sun, they said.